Today's bento idea came from my kid's music book. I was too lazy to make a copy on the paper so that boy and his flute were cut by hand. I made 3 hair styles but I thought this one was the best. I used my x-acto knife to do it. Please ... please remember never ever catch your x-acto knife by hand. If the knife rolls from your kitchen table, just let it go. A little accident in my kitchen this morning: I had my own stunt to catch my x-acto knife ... and the result was I cut my own right thumb around 2cm and it was quite deeply cut. I took the ice from the fridge and towel then pressed it on my thumb. It was the quickest thing I could think of. The boy was made from ham, egg sheet, cucumber, nori, and red part of crab stick. And the flute was made from carrot. Inside the box : pork belly cooked with mushroom in soy sauce and mirin, Chinese spinach with corn, carrot, orange, and longan. Oh no, I'm sorry you shed blood for this cute boy. He is very darling and you seem to have the talent for cutting free hand with out patterns so well! I hope it heals quickly for you. I think we have all had knife accidents -- I usually slip when cutting carrots. Good advice to let the knife drop; and make sure to step out of the way of it too! Aw! He is so cuuute! I whised there would be a game with him as main character! ;) Really great, you made it so beautiful! Oh dear, I hope the wound will heal fast! Poor you for the thumb hurt.Hope it will getting better soon. Got to be more careful as well when we are working those tiny details out..
Waaaahh... ketinggalan bento nomor 93! Tadi masih si tummies endut hehehe. Wah Mbak, time flies so fast ya? It's bento #93!!!! Can't wait to see the celebration of your #100 bento, it must be great :D.
Oooo so sorry for your right thumb, hope it will heal quickly so you can still make another lovely bento :D.
Your free hand hair cut is fab. I think I need hundreds trial to make the one like yours :D.
@Rachel Hei : It's just my reflex to catch something that wanna fall down but totally forgot that knife is really sharp hehehe ... :p Thanks a lot Rachel! Heal quickly... the ones on your fingers hurt the most because we use them so much! Before I read your post, I always try to see if I could guess the ingredients you used. It's fun looking at these cute bentos you make. @Angi : Thanks a lot Angi! Yup, it kept bleeding for a few first hours because the thumb moved a lot. Now I put some medicine and waterproof band aid so no aww ... aww when I take a bath later :D And longan is usually what we called dragon eye fruit. You can search it from google to see more about this fruit. The little boy looks terrific! Hope your thumb heals quickly. @purple angel : Thanks a lot Sysyl! Gpp kok luka kecil doank ... cuman potong2 aja ngikutin bentuk gambar yg di buku musik hehehe :) Sysyl pasti bisa deh! Kayak gunting kertas tp ini pake pisau. Oh Lia, so sorry to know that you are hurt. Are you OK now? Just one week ago one of the blogger nearly chop off her finger when cutting chicken. Please be very careful. The music boy really looks like enjoying himself. ouchie!! Don't hurt yourself Lia! : ) Still, amazing bento today. Oh, dear Lia, so sorry to hear of your accident! May your thumb heal quickly and painlessly. 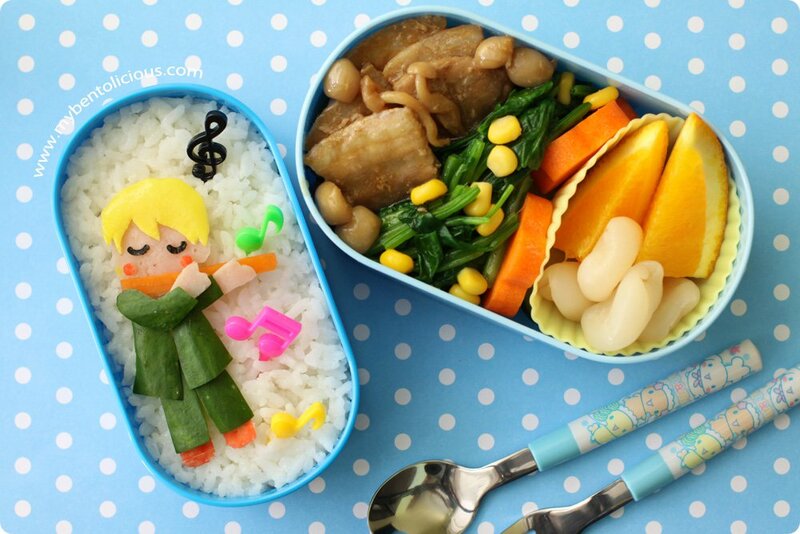 What a beautiful, musical bento this is! I love the play of fresh spring colors against the blue! *Hugs*! OMG stumbled onto your site and I am so amazed! These are beautiful works of art!!! @Rachel : Thanks a lot Rachel! Adui ! Hope u have a speedy recovery. Hati-hati ya! Oh Lia, this is amazing!!! I am always in awe of your creativity!!! @Susan Yuen : Thanks a lot Susan! You are one of my inspiration. Thanks for always encourage me with your kind comment :) I really appreciate it. @Lia : Thanks a lot Lia! hehehe ... and I feel like reply comment for myself :D Love your blog too very much, fabulous and super creative!! @oohmyfavorite.com : Thanks a lot for your kind words and for visiting my blog! Really appreciate it :) You are welcome to come back anytime. uh oh, sorry to hear you cut yourself! my x-acto rolls off sometimes too, and one time it stabbed my floor and was just sticking there straight up, defying gravity! the dangers of bento making, HAHA! cute flute playing boy, and fantastic use of the music note picks. and that pork belly looks succulent and delicious!